QLogic: 3 words - caching SAN adapter. Just blew your mind, didn't we? QLogic has announced its transparent adapter-based flash caching aimed at accelerating applications that access a SAN for data. FabricCache is the first product implementation of its Mount Rainier technology and, as well as adding a flash cache to QLogic's Host Bus Adapters (HBAs), it shares that cache between clustered servers and the apps that run in them. In other words, it transparently shares cache performance across servers on the SAN. In fact clustered servers which each have a FabricCache, actually have, logically, a single virtual cache per SAN LUN, and virtual machines can move between these servers without losing cache coherency. The cache is transparent, shared by all servers, and all SAN LUNs are available to all servers. The product supports live virtual machine migration without refilling the cache and supports automation - such as the Distributed Resource Scheduler, which balances out resources across a server cluster. QLogic contrasts its approach to one where servers have individual flash caches, equivalent to direct-attached storage. It's a slight distinction in a way as, in both cases, the servers have a PCIe flash card. In the QLogic's case it's part of the fabric, at the server edge, and in all other PCIe flash card HW/SW implementations, such as that of Fusion-io, it is not, as it is logically in the server. In QLogic's case, it's shared between clustered servers as well. EMC's XtremSF and XtremSW aim to support vMotion between servers as well and other PCIe caching product suppliers are moving in the same direction. QLogic FabricCache with flash card behind HBA. 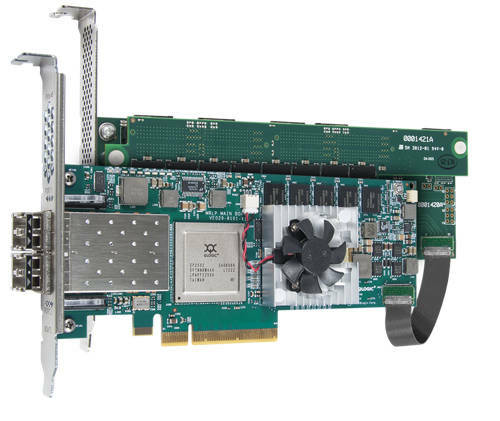 The dual port 8Gbit/s Fibre Channel FabricCache QLE10000 adapter comes bundled with an SLC PCIe flash card. It is a 2-card product that's available in two versions: the QLE10522-C has a 200GB flash card associated with it, while the QLE10542-C has a 400GB flash unit. Both logically appear as a single standard HBA. No host server CPU cycles are used to operate the card. There is an API with the product, though it isn't currently being announced. Potentially third-party caching algorithms could be used by ISVs through this API. Storage management apps could manage the adapter in-band through the API. QLogic said it expects ISV partners to take advantage of these APIs. There are also plug-ins for VMWare, Windows and Citrix. The FabricCache products integrate with QLogic's Storage Routers, which, by the way, support online and offline data migration. The new kit provides read and write-through caching. In the future write-back caching will be supported. QLogic says FabricCache is agnostic to flash card suppliers. It is working with one flash card vendor now but a range of certified suppliers and cards will be announced in June. We might expect LSI and Micron to be included in that list. They will be SLC (single layer cell) cards because that is needed for a long working life, although enterprise class multi-layer cell (eMLC) cards might be supported in future. That means QLogic isn't providing traditional PCIe flash card performance measures like random read and write IOPS and sequential read and write bandwidth. These come from the specific flash card suppliers and FabricCache delivers them. UK-based hoster Carrenza found that, with Microsoft SQL 2008 running on a VM, the non-cache performance was ~120MB/sec while the cache performance was ~350MB/sec. QLogic has trained up channel partners and will be doing some end-user marketing to raise awareness. There might be OEM deals for FabricCache in future. David Floyer, the CTO and co-founder of Wikibon, said: “By placing the cache in the fabric, and supporting it with a standard Fibre Channel HBA driver, the caching becomes transparent to the application host system and storage system." He said he thinks this is a simpler and lower cost implementation to install, manage and grow for FC SANS compared to, for example, adding PCIe flash card hardware and software caching at the server level as opposed to the fabric level.